We provide city water pump sales & repair to areas in and around Orlando, Florida. Cities and towns of all sizes often have pumping stations in order to supply the local residences and businesses with water. A basic model of this type of pump can typically supply more than 10 times the amount of water that a water tower can supply, and a pumping station can also include a filtration pump to ensure delivery of clean, fresh water to the city’s citizens. Depending on the water table in the area, the pump may be more beneficial near the sewage treatment plant to help with recirculation, while higher water tables will need the pumping station to be farther away to prevent contamination. 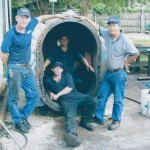 At Pat’s Pump & Blower, we provide city water pump sales & repair to areas in and around Orlando, Florida. If you are a city official who has been considering the benefits of adding a pumping station to replace the water tower, call our sales team today. We can talk to you about options, pricing, and some of the best brands on the market, whose products we carry. Our city water pump sales & repair team has a lot of experience and knowledge with installation and maintenance of these pumps, so we can help. When looking at city water pump sales & repair options, consider whether your city needs to add a filtration pump. This can increase the cost, but can also help increase the water output substantially, so it is beneficial to larger areas that need more water. They do not guarantee complete removal of pollution, so consider that, as well.